Help! My toddler isn’t talking. 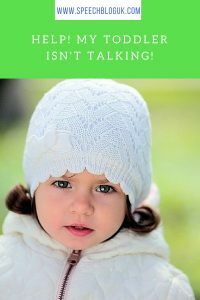 One of the things I most commonly get asked about is toddlers who are slow to start talking. I have written about this before, but I felt like there was quite a bit more to say on the topic, so I thought I’d tackle it again. How many words should my child be using? Just like walking, potty training, learning to read and every other developmental milestone, there is a wide range of what is considered to be “usual”. It’s more complicated than just giving you a number, as I’ll come onto in a minute, but the figure that’s usually quoted is that a child should have around 50 words at the age of 2 and be beginning to link words together into 2-word phrases. You can find more information about this here. What do we mean by a word? This may sound like an obvious question, but actually I’ve worked with young children for long enough to know that different people count their child’s first words differently. Some people count any attempt as a word, some people count words that a child copied once but doesn’t use regularly, some people only count words that are said 100% correctly. So when I ask a parent, “how many words does your child use?” the answer often needs a bit of unpacking! None of these are wrong ways to look at it, but obviously you can come up with quite different answers depending on how you count! When we talk about a child’s first 50 words, we don’t expect them to be said correctly. If you know that every time your child makes that set of sounds they mean the same thing, then it’s a word. 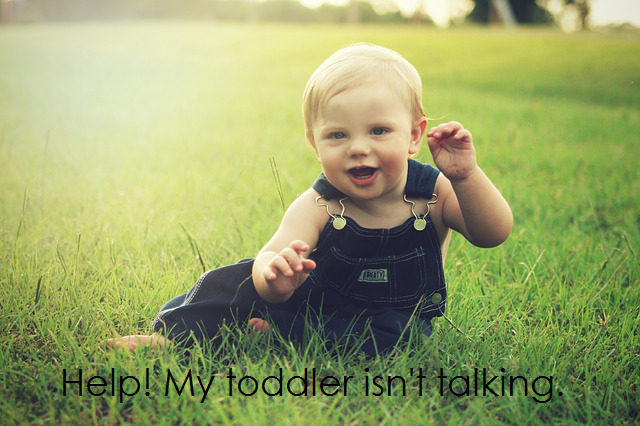 It’s perfectly normal for sounds to missing or said incorrectly in a toddler’s early words. The short answer is that I can’t really tell you. There are some obvious factors such as hearing (do get your child’s hearing checked if you’re concerned about speech delay). However, this isn’t always the answer. There is some research that shows that the environment the child grows up in is a factor. However, that doesn’t mean that anyone is judging your parenting or blaming you because your child is slow to talk! Even speech and language therapists can and do have children with delayed language! Speech and language delays often run in families. However, it may well be that none of these factors apply and your child is still a late talker. It’s not likely that someone will be able to answer this question for you at the first appointment, and you may not ever get a definitive answer – some children just take longer to speak than others! If your child is over 2, isn’t saying 50 words and you are concerned, do get them referred to speech and language therapy. You can find out more about how to do this here. There are things you can do to encourage your child to develop more language skills and although you can find some great general guidance here and on other websites, a speech and language therapist will be able to fully assess your child and tailor the advice and strategies more specifically for your child. Nothing you find on the internet is a substitute for seeing a speech and language therapist. 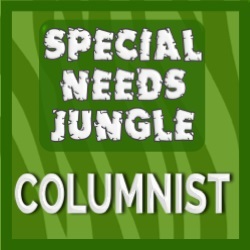 Is a speech therapist more concerned about some 2 year olds than others and if so, why? Yes! When you see a speech and language therapist for an assessment of a 2 year old, it probably seems like they didn’t really do a lot. I usually spend about half the appointment talking to the parent, and the other half playing with the child. I have some favourite activities I often try, but I don’t really do anything special, and I rarely do any formal assessment with a 2-year old. Instead I just play with the child with whatever they’re interested in for a while. However, while I’m playing, I’m looking at lots of different things. Is the child using the words he knows regularly? Is he using his words to communicate? Is he using any other ways to communicate as well (pointing, gestures, screaming, changing intonation etc)? Is he able to follow any instructions? Is he able to take turns with an adult? Does he try to copy? Does he give eye contact? Is he frustrated? Does he play with a range of toys and will he let me join in with his play? The answers to all these questions will dictate how concerned I am about a particular child, and what advice I will give. I am usually more concerned about a child who isn’t really communicating effectively than I am about a child who can get across everything he wants to say without using words. Will my child “catch up” with his peers? Unfortunately, I can’t tell you this for certain either. I can tell you that I have seen many, many 2 year olds with only a few or even no words, who rarely stopped talking a few months later. The transformation can be dramatic. However, this doesn’t happen for every child. Some will still be language delayed a year or so later, and for a few it is a bigger and more ongoing problem. That’s why it’s a great idea to see a speech and language therapist as soon as you can if you are concerned. However, I do realise that this can be difficult and entail a long wait in some places! If you are really struggling to get a referral and you are concerned, try some of the following:- The ICAN helpline here, an independent therapist if this is a financial option (find one here) and looking at the other websites linked to in this post. 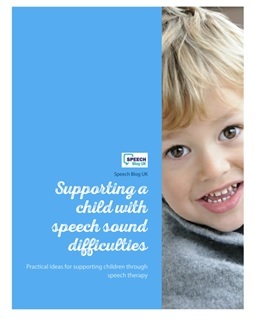 Also, if you have found this post useful, do check out our e-book, which is full of practical advice to help you and your child at every step of the way through the speech therapy process. Working speech and language targets into daily routines: a trip to the park.